The garden looks green and healthy. I spent the last hour pulling weeds! Boy, do they grow fast! The carrots are thinner than I want and my green bean stand is weak as well. I will plant a few more rows of green beans to make up for what didn’t germinate earlier this spring. I have spent hours planting, watering, tilling, hoeing, weeding and now it’s time to fertilize! We often forget about fertilizing and wonder why we didn’t get as much produce as expected. Over-applying fertilizer can cause as much heartache as under-applying. To be sure you’re applying the right amount, follow label directions and use the 4R’s of nutrient stewardship. 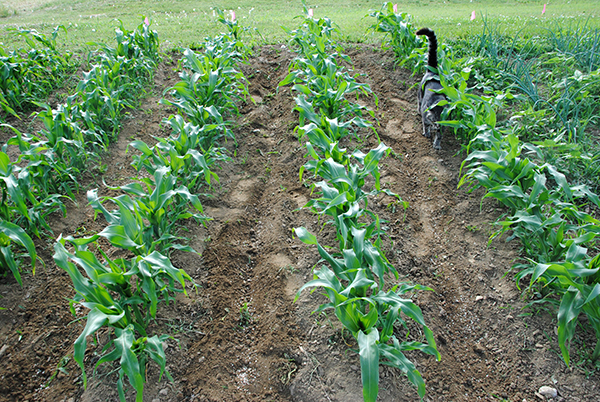 In this photo series, I am fertilizing sweet corn using the sidedress method. 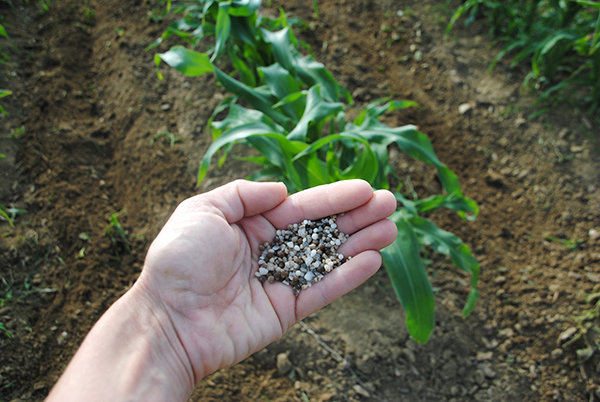 Right Source – Match fertilizer types to your garden plant needs. Right Rate – Match the amount of applied nutrients with what the plant is actually missing and do not over-apply. Right Time – Apply nutrients when plants can best use them. 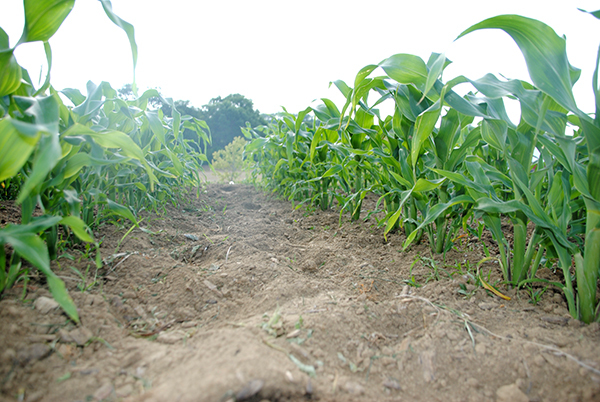 Right Place – Match amount of fertilizer to plant needs. Follow label directions carefully. Right Source: I am using a granular fertilizer that is a 10-10-10. This balanced fertilizer will help keep the plant strong, healthy and growing. Right Rate: According to the package label, I need to use 1 ½ pounds per 100 square feet. 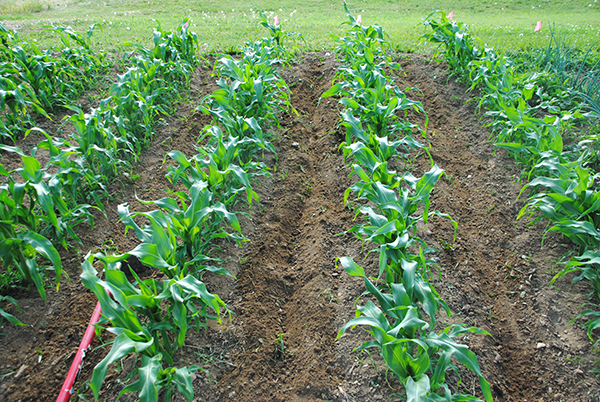 Right Time: Sweet corn should be fertilized when it reaches 12 inches tall. Right Place: I dug a shallow trench, scattered the granules, and covered the granules with soil. 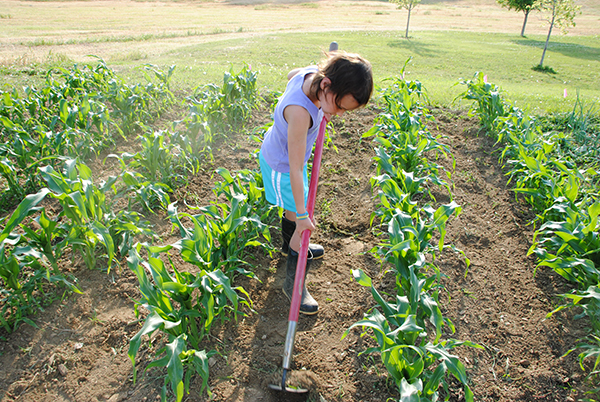 Watering the soil after fertilizing allows the fertilizer to activate allowing the roots to soak up the nutrients of nitrogen, phosphorus and potassium. Too much and too close can burn the plant, so fertilize cautiously. I like using the 4R’s approach to fertilizing the garden. It gives me four points to think through as I strive to maximize the fertility of the soil that will give me an abundant harvest. I can hardly wait to pick this sweetcorn and eat it right off the cob!